Seven Seas Entertainment, 9781935934295, 621pp. 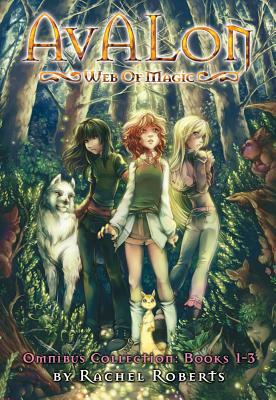 This omnibus collection includes the first three books--Circles in the Stream, All That Glitters, and Cry of the Wolf--from the sweeping middle grade fantasy series, Avalon: Web of Magic. This edition comes brimming with lovely illustrations, ornate maps, and a bonus bestiary of fantastical creatures. Three very different young teens--Emily, the shy one; Adriane, the outsider; and Kara, the power shopper--are all drawn to a secret place deep in the woods where they discover a portal to another world. Wondrous animals have emerged from the portal, on the run from a dark threat bent on destroying them all. Emily, Adriane, and Kara are chosen to protect the magical animals and save their world, but to do so, the girls must overcome their differences and band together. They begin a perilous quest to discover Avalon, the lost, legendary home of magic, little knowing the terrible dangers they must face along the way. Rachel Roberts is the author of Avalon: Web of Magic. She has revised the entire twelve-book series for this republication. Roberts toured extensively for the first release of the Avalon series in the "Avalon: Music is Magic Tour," a scripted musical event featuring songs, prizes, and author signings. She lives in California.